1. EVADING OR ESCAPING DISCOVERY, RECOGNITION OR IDENTIFICATION IN THE COMMISSION OF ANY PUBLIC OFFENSE. 2. CONCEALMENT, FLIGHT OR ESCAPE, WHEN CHARGED WITH, ARRESTED FOR OR CONVICTED OF ANY PUBLIC OFFENSE. Punishment for a Class 1 misdemeanor in Arizona is up to 6 months in jail and up to a $2,500 fine. The purpose of this bill appears to be to go after guys like Dave VonTesmar. 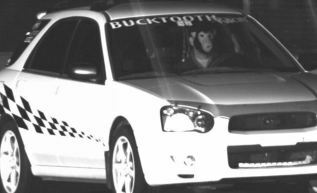 Dave gained notoriety in 2009 because people were driving his car and speeding past the speed cameras while wearing a monkey mask. He reportedly received close to 40 tickets, and at least half of them were thrown out because the prosecution couldn’t prove that he was the person in the picture, and therefore the driver when the offenses occurred. To date, he’s refused to pay the other tickets. As a flash mob organizer and participant, this proposed law makes me a little nervous. If it passes, I hope law enforcement and the prosecutor’s office make a distinction between people who use a disguise in order to commit a crime or evade law enforcement and people who commit crimes while wearing costumes. It’s an issue of intent. It’s clearly wrong to wear a Nixon mask while robbing a bank to avoid being identified. But if you’re doing a flash mob or a prank that involves wearing a costume, or you’re involved in cosplay and you happen to commit a crime while you’re in costume, you shouldn’t be punished for concealing your identity, just the other crime you committed. Let’s say somebody organized a Zombie Die-In and they did it in the street without permission, the participants could be arrested for blocking a thoroughfare. They shouldn’t be charged with concealing their identity just because they were in costume at the time. By the way, the organizers could also be facing solicitation and conspiracy if they did a stunt like this. If you’re curious about the legalities of flash mobs and pranks watch this video. I’m curious to see if this law will be passed and what the implications will be if it does. If someone is planning on committing a crime while trying to conceal their identity, this law won’t stop them from putting on a mask or even just a hood and sunglasses to avoid being identified. It will simply give law enforcement another charge to throw at them when they get caught. If you want to know more about flash mob law, I wrote an entire book about it. You can also connect with me on Twitter, Facebook, LinkedIn, or you can send me an email.